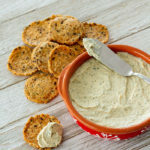 This cheese spread is like a veganized version of a Boursin-style cheese. A creamy, spreadable cheese filled with herbs and flavor. Perfect for serving with crackers, raw vegetables, or spread on a bagel or slice of baguette. It would also be a fantastic addition to a bento. Put the raw cashews in a bowl and cover with water (by about 2-inches). Let the cashews soak for at least 2 hours, or overnight. When you are ready to make the cheese spread, drain the cashews well. Drain the tofu and pat it dry with a paper towel, then place it on a large plate lined with several layers of paper towel. Put several more layers of paper towel on top, then place a cutting board on top of that. Weight the cutting board down with something like several cans of food or a book and let the tofu press for at least 30 minutes. Add the drained cashews, pressed tofu, 2 tablespoons water, lemon juice, apple cider vinegar, sea salt, maple syrup, and nutritional yeast to a food processor (or high-speed blender). Blend until smooth, stopping to scrape down the sides with a rubber spatula as needed. This is a thick mixture, so it will take some time to process it into a smooth and creamy consistency. Once it is smooth, add the remaining ingredients and process briefly until the new ingredients are evenly incorporated. Store the cheese spread in an airtight container in the refrigerator. The spread will stay fresh for up to two weeks.